FREE! Here's an Automatic Step By Step System for selling your house fast and for Top Dollar when an agent can't do the job. 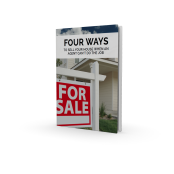 If we don't buy your house, this book will show you how to sell it for EXACTLY what you want AND how to avoid paying annoying commissions. Give us your information and we'll send you our proven step by step system, "4 Ways To Sell Your House When An Agent Can't Do The Job," and contact you with a fair offer. © Liberty Property Solutions, LLC All Rights Reserved.